Ectopic pregnancy, also known as a tubal pregnancy, occurs when the pregnancy implants outside of the womb. It can occur in several places, eg. the ovary, the abdomen, the cervix, at the join between the tube and the womb (cornua), but the most common place is within the fallopian tube. Pregnancy can even occur in both the womb and the tube at the same time (heterotopic pregnancy), but this is rare, occuring in only about 1/10,000 pregnancies. Previous tube infections (salpingitis), such as pelvic inflammatory disease,chlamydia, and gonorrhea. Previous surgery inside the abdomen, especially involving the fallopian tubes, ovaries, uterus, lower abdomen, or bowels (Local surgery to the outside of the cervix is not a risk factor.). Use of fertility medications at the time of conception. Prior history of tubal pregnancy. The use of an intrauterine device does not increase the risk of ectopic pregnancy. However, a normal pregnancy is unlikely with an IUD in place, so if a woman becomes pregnant while using an IUD, it is more likely the pregnancy is not inside the uterus. The woman may not be aware that she is pregnant. These characteristic symptoms occur in ruptured ectopic pregnancies (those accompanied by severe internal bleeding) and non-ruptured ectopic pregnancies. However, while these symptoms are typical for an ectopic pregnancy, they do not mean an ectopic pregnancy is necessarily present and could represent other conditions. In fact, these symptoms also occur with a threatened abortion in non-ectopic pregnancies. The symptoms of an ectopic pregnancy typically occur six to eight weeks after the last normal menstrual period, but they may occur later if the ectopic pregnancy is not located in the Fallopian tube. Other symptoms of pregnancy may also be present in ectopic pregnancy. Expectant management – a proportion of all ectopics will not progress to tubal rupture, but will regress spontaneously and be slowly absorbed. This may be appropriate if the level of hCG is falling and a woman is clincally well. Medical treatment – with a drug called methotrexate, which is given by injection. This makes the ectopic pregnancy shrink away by stopping the cells dividing. Only a few ectopics can be treated this way, which is the least invasive. Certain criteria must be fulfilled, such as small diameter of the ectopic and low level of hCG. Close follow-up with further scans and blood tests is also necessary. Laparoscopic surgery – via ‘keyhole’ surgery, it may be possible to either open the tube and remove the pregnancy (salpingotomy), or remove the tube altogether (salpingectomy). The decision on which of these options is taken is very specific to each patient. Follow-up with blood tests for hCG will more than likely be needed as persistant ectopic tissue can occur in 5% to 10% of patients. Open surgery (laparotomy) – this involves a 5cm incision at the top of the pubic hairline. 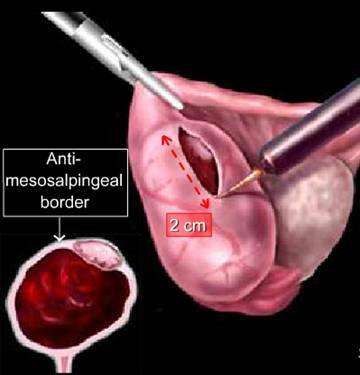 The affected tube is brought out and either salpingotomy or salpingectomy performed. The best way to prevent ectopic pregnancy is to decrease your risk factors. If you are diagnosed with pelvic inflammatory disease, take the prescribed antibiotic as directed until it is all gone, then follow up with your doctor to be certain you are cured. Avoid gonorrhea, chlamydia, and other STDs by using a diaphragm or cervical cap or insisting that your sexual partner wear a condom (rubber). If you plan to get pregnant soon and you are using an intrauterine device (IUD) for contraception, discuss this with your provider. Surgery of the reproductive system, bowels, or lower abdomen can lead to scarring, which increases your risk of ectopic pregnancy.